Suitable for Bikes , Mountain Bikes Handlebar with diameter 15-35mm.The Bicycle mirror length is 7 cm (2.75 inches) Width is 5 cm (1.96 inch). Easily Install and Remove: Can be easily install even with no tools. Durable : Made of ABS Material ,Glass mirror and silicone rubber belt support a clear view and fastness. Multi-Function :The rear bike mirror 360 horizontal rotation, 90 degrees counterclockwise or clockwise rotation help you watch every direction of your back. 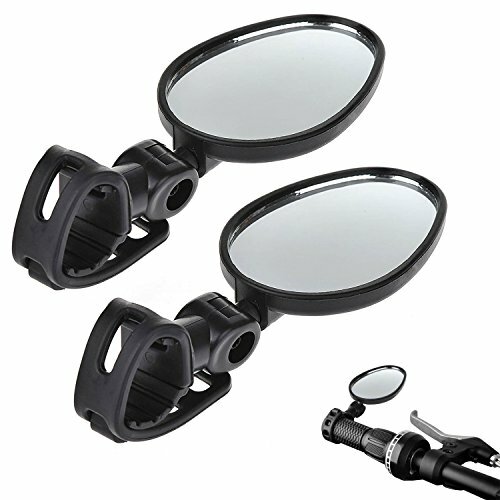 "ALL OF OUR BIKE MIRROR HAVE 30 DAYS MONEY BACK & 6 MONTHS GUARANTEE "
If you have any questions about this product by Newlight66, contact us by completing and submitting the form below. If you are looking for a specif part number, please include it with your message.